Barbella, important musicians in the history of Neapolitan and French music, had several possibilities to become famous in the future world. Internationally renowned as orchestra conductor and composer, he often performed with Lord Fortrose and Lord Hamilton, English ambassador in Naples, where between May and June 1770 he met and played with two German musicians, father and son, in their musical journey in Italy: Leopold and Wolfgang Mozart “young prodigy and musical promise “. Between October and November of the same year started the friendship with the English musicologist Charles Burney, the witness of those musical encounters. The Mediterranean flavour of the future Mozart and English music is born in those appointments on a sunny afternoon, in the beautiful living room of a Neapolitan apartment, while outside … all the possible harmony: the song of birds, the sound of the sea on the beach and the voices towards the Villa Reale. Emanuele was born in Naples on 14 April 1718 from Francesco, a violin professor, and Antonia Muscettola. His mother was the sister of Teresa Muscettola, who had married in 1716 the composer Michele Gabbalone [or Gabellone]. In “The Four Ancient Conservatory of Music in Naples” written by Salvatore Di Giacomo, his father’s activity is confused with the one of Emanuele. For the author, he was born in 1704 and considered “son” of the Conservatory of S. Onofrio, where he later taught violin from 1717 to 1734. But the discovering of documents concerning his birth validate the year 1718. Historian, musicologist, and traveller Charles Burney in his “General History of Music” (3, p.570) wrote: “Among the violin players of the old school, it would be unjust not to bestow a few words on my late friend Emanuele Barbella, of Naples. Of this agreeable artist’s musical abilities and singularities of character, an account has been given in my Italian Tour […] and among other things complied my request of giving me an account of his own musical education, of which, as it is short and characteristic, I shall here insert a translation. This strong sense of humility suggests a simple, witty and intelligent personality of a man who knew how to express the joy, goodness and passion in his compositions. Following after Jommelli, they are balanced between mind and heart, striking the soul of the listeners. The violin school from which he derives makes him a symbol, thanks to his new master Pasquale Bini’s performances, a pupil of the great Giuseppe Tartini. His training was all Neapolitan and European, started with his father and continued with Angelo Zaga (before Bini) and then at the Conservatory of Santa Maria di Loreto under Nicola Vitolo, teacher of the Conservatory from 1739 until his death in 1743. Emanuele was also a pupil of Nicola Fiorenza for a few years, presumably. The first teacher of composition was his maternal uncle, Michele Cabballone (Gabellone) and later, as he claimed, the famous Leonardo Leo (around 1740-1744). In this period is documented his participation at the Musical Chapel of the Treasure of San Gennaro, where he appeared in 1734, in 1741 and 1743 among the extra-violins in the illuminations of September. Later he was engaged in the activities of the orchestra of the Teatro Nuovo. In 1753, as the first violin of this theater he composed several arias, a finale and a duet for the comedy “ELMIRA GENEROSA” which featured this subtitle: “Commedea pe mmusica de notà Pietro Trinchera, da rappresentarese a lo Teatro Nuovo a mmonte Cravario nchisto carnevale dell’anno 1753‘. It is important to acknowledge that the original composer Nicola Logroscino never completed this comedy. n such cases, the first violin of the theatres accepted to complete the composition, as well as the concertation and direction of the work, a typical role of the Maestro di Cappella. In 1756 Barbella was engaged in the royal chapel as a musico di violino, and from 1761 he also entered into the Orchestra of the Teatro S. Carlo. The name of Emanuele Barbella already appeared in France alongside the names of Corelli, Vivaldi, Geminiani, Locatelli, Valentini, Guerini, Tartini, Piani, Mascitti, Giardini, Ferrari, Pugnani, Leclaire, Devienne, Senaille, Mondonville, Gavinies, Le Blanc, Zimmerman, etc. 1770 is a particularly important year for several reasons. After the meeting with the Mozart, a second meeting fixed his life in the history of music: the one with the aforementioned English musicologist Charles Burney, which took place in the autumn of the same year. During his Neapolitan stay, Emanuele furnished a great help providing unbiased, important, and unpublished news about the history of music and musicians of the city of Naples. Between the two had formed a good friendship, continued by correspondence until at least 1773, the year in which Burney, mistakenly, believed that Barbella was dead. This English channel opened by Burney contributed to the growth of the composer’s fame also in England, increased by official publications of his manuscripts, often part of superlative collections for the violin. In the few bibliographical records that survive today, even if he is not among the best Italian violinists, he has been an esteemed artist and admired as a teacher and composer. Pleasant and well written in a mix of European and Mediterranean style, his compositions achieved great success in London and Paris. Burney was impressed by “a good dose of fantasy”, probably due to the great knowledge that he had of Tartini’s style. The compositional surprises of Barbella (“a tincture of non-cheerful madness”), are nothing more than the personal elaboration of the harmonic and rhythmic formulas already in the Paduan composer’s technique, inventively filtered by the language of the great Neapolitan tradition. The humorous sides identified by Burney are the programmatic titles and the innovative indications of time that can be found in his instrumental works. His kind and good nature and his simple serenity probably contributed to his effectiveness as a teacher and above all to the esteem in which his contemporaries held him. Burney mentioned him for the last time writing upon their last meeting (November 7). He spent the whole evening collecting material related to the history of the Conservatories of Naples and the ancient composers and virtuosos of the Neapolitan school. Some musicologists thought the due to the spread of his music, especially in England (but also in France! ), Emanuele Barbella visited these two countries. However, it is not confirmed by any biographical information. Instead, we know that Emanuele was in love with his city and its traditions and lived in Naples in music and enchantment of nature, remaining unmarried for all life and died there on January 10, 1777.
favoured by violin amateurs who crowded music shops seeking for the latest works of the best Italian and foreign composers. Not without reason, it is possible to find the same edition in precious collections of important European libraries, on top of a group of violin sonatas composed by the most prestigious violinists-composers of the era, such as Pesch, Lolli, Pugnani and Ferrari. According to the original manuscript, performers had the choice to be accompanied by a harpsichord with or without basso continuo or by another violin as “Bassetto”, with a mute device placed at the bridge. This expedient highlight the great versatility of this music, which had to be effective even with a simple accompaniment of another violin. These Six Sonatas in three movements are all with the A-A1-B structure. Immediately after the first listening we are fascinated by the nobility and originality of musical ideas: the cheerfulness in first movements, the phrasing pathos of central parts and the liveliness of final movements overwhelm entirely the listener in a tasty of Mediterranean style, where captions are featured and sometimes borrowed from the Commedia dell’Arte, such as la Napolitana sul fare di Pulcinella, l’ Italiana, la Venetiana, l’ Inglese, la Francese. 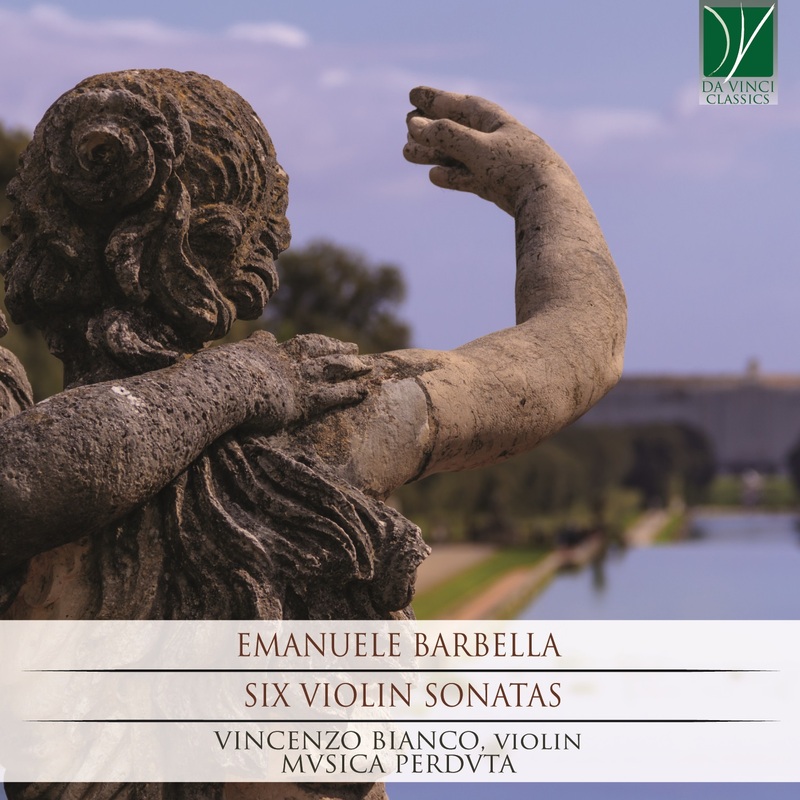 The purpose of MVSICA PERDVTA and the baroque violinist and Neapolitan violin teacher Vincenzo Bianco is to offer all the beauty and the “taste” of these pieces easy to listen (dutifully interpreting the intentions and indications of this delicate and brilliant composer). At the same time revive the beautiful pages of a violin virtuoso of the Naples of 1700, who has a significant position in the reconstruction of the history of Neapolitan violin in Europe. Together with Barbella and many other Neapolitan and European composers, we do not neglect to ascribe at the end of this work of research, study and recording, the baroque clause that often we can read at the end of the manuscripts of any inspired composition: “In Deo soli Gloria”. MVSICA PERDVTA is a cultural association founded in 2007 by Renato Criscuolo and Valerio Losito, engaged in research, in libraries and archives, of unpublished or still little known music by eminent authors and composers, mainly from the seventeenth and eighteenth centuries that, despite the talent and the compositional expertise, did not have justice from the history of music and deserve to be reevaluated. Also, the music found is re-proposed in concert, often in the first modern performance, using original Baroque instruments or faithful copies of them. MVSICA PERDVTA has also managed the Spiritual Concerts in the Oratory of San Filippo Neri at the sacristy of S. Maria in Vallicella in Rome from 2008 to 2011 and TodiMusicAntica Festival Paolo Antonio Rolli in Todi, from 2013 to 2017. Among the numerous discoveries of the research group is the double version cantata Mira Lilla gentile by G. F. Haendel, the motet Vos Invito RV 811 and the aria Se fide quanto belle RV 749.32, both by Antonio Vivaldi, three sonatas for cello and basso continuo by Nicolò Porpora and various alternative versions of cantatas by Giovanni Battista Pergolesi, in addition to the rediscovery of minor composers such as Francesco Maria Zuccari. At the organological level, the research group has studied and reconstructed the bass violin, the ancestor the cello, and studied its solo repertoire. The research group organized in 2008 a conference at the Sacred Convent of Assisi entitled Ten Mysterious Sonatas, for the attribution of a splendid anonymous manuscript of sonatas for cello and basso continuo, and, the following year, in collaboration with the University of Rome2 Tor Vergata the conference/concert Around JJ Rousseau, a philosopher musician. The baroque ensemble with original instruments has performed in important Italian and European festivals, among them the Halle Haendelfestpsiele, Musique et Mémoire, Gdańsk Animamusicae, Roma Festival Barocco, Festival Barocco di San Gimignano, Festival of Pietà deìTurchini in Naples, Signs Barocchi, MusicaSibrii and others. The ensemble has six recordings for the labels Brilliant Classics, Urania Record and Da VInci most of which contains unpublished works found by the research group. MVSICA PERDVTA has released a CD for Classic Voice Classic Antiqua (No. 5 around the Oratory of San Filippo Neri) and music for the I-phone application "i-MiBAC -Top 40": the first of a series of applications mobile telephony, multi-issue and free, dedicated to cultural heritage, issued by the Ministry for cultural heritage and activities. He has collaborated several times with the Handel House in London for the performance of music by the great Saxon composer. Vincenzo L.A. Bianco: Violinist, Neapolitan trained, violin teacher in Naples at the Secondary School, he obtained the Classical Maturity at the “A. Genovesi “ High School, at the same time he studied with the teacher G. Francavilla, first viola of the old Scarlatti Orchestra, graduating with the maestro F. Mezzena at the Conservatory of Pescara. He obtained a “Laurea in II Livello per l’ Alta Formazione Musicale” at "S. Pietro a Majella" Conservatory in Naples. He deepened his executive practice of the baroque violin with Enrico Onofri and with Chiara Banchini, with Nicholas Robinson and Alessandro Ciccolini, specializing at the Conservatories "D. Cimarosa "of Avellino and" S. Pietro a Majella " of Naples. He collaborates with formations of ancient music (MusicaPerduta, Musica Sacra Basel, Concert Dei Cavalieri, Talenti Volcanici, Il Labirinto, The Soloists of the Chapel of Pietà deiTurchini, Ensemble Le Musiche da Camera, Ensemble Carlo Gesualdo and Fanzago Baroque Ensemble ,of which he is leader and founder) and also with important Neapolitan Orchestras (Orchestra del Teatro S. Carlo - direction by Jeffrey Tate and Riccardo Muti, Orchestra A. Scarlatti and Orchestra of the Conservatory S. Pietro a Majella, Orchestra I Soloists of Naples and I Soloists of S. Carlo "). His solo activity at Baroque festivals and international festivals allowed him to play in several European and Italian cities such as Sofia, Basel, Munich, Hildesheim, Vienna, Oslo, Rome, Assisi. Milan, Naples. With Musica Perduta he performed in the "Festespielmusik" at the " Händel-Haus" of Halle, in Varese, Todi and in Naples,( where he performed ) performing the cantata "Apollo e Dafne" by G.F. Händel for the owners of the " Händel-Haus" Museum from London. In Naples he collaborates with the Center of Ancient Music "Pietà dei Turchini" where he performs concerts and unpublished Neapolitan sonatas. Besides recording for different record companies with different groups of ancient and baroque music, he recorded for OFM Conv. ,between 2004 and 2007, three volumes of "Incanto Serafico" for which he received a letter of praise from Pope Benedict XVI. As an interpreter, instrumentalist and composer he cultivates his passion for musicology and deals with research and promotion of unpublished Neapolitan and European ancient scores, as well as of the historical re-evaluation of the Neapolitan Violin School. As a composer and transcriber of unpublished works, he has written and performed various music for the Neapolitan Church and for shorts films and film fragments, writing some music for Giancarlo Siani's film "Ci devo pensare". He was co-founder of "I Figlioli di Santa Maria di Loreto". He currently collaborates with the baroque ensemble "Musica Perduta" of Perugia. He plays an instrument from 1780. Emanuele Barbella (b Naples, 14 April 1718; d Naples, 1 Jan 1777). Italian violinist and composer. His first teacher was his father, Francesco Barbella, composer and maestro di violino at the Conservatorio di S Maria di Loreto. He was later instructed by Angelo Zaga and by Pasqualino Bini, a noted pupil of Tartini. In theory and composition he was the pupil of Michele Cabbalone until the latter's death in 1740 and subsequently, until 1744, he studied with Leonardo Leo. The story that Leo thought him stupid resulted from a misinterpretation of Barbella's humorous modesty in the autobiographical sketch he provided for Burney's History. In 1753 Barbella became first violinist at the Teatro Nuovo in Naples, and three years later he entered the royal chapel there. From 1761 until his death he was a member of the orchestra at S Carlo. It is possible that he visited England during the 1760s, for his op.1 was printed in London by Oswald ‘for the author’. Although there is no evidence that Barbella ranked among the finest Italian violinists, he was respected as a performer and admired as a teacher and composer. Burney, who became his friend and relied on his knowledge, confessed to some disappointment in his playing, complaining of lack of variety, ‘drowsiness of tone’, and ‘want of animation’. Yet he found much to praise also, especially when hearing Barbella in a small room, and spoke of his ‘taste and expression’ and of his ‘marvellously sweet tone’. Barbella’s compositions, which evidently achieved a modest success in London and Paris, reflect his position as a disciple (through Bini) of Tartini. The craftsmanship is sure, but what seemed to Burney as ‘a good deal of fancy’ appears as no more than graceful imitation of Tartini's style. Occasional harmonic surprises (according to Burney, ‘a tincture of not disagreeable madness’), may represent Barbella's interpretation of Tartini's harmonic theories. The humorous side of this attractive musician's personality is sometimes seen in bizarre programmatic titles and unusual tempo indications. His good temper and stable character probably contributed to his effectiveness as a teacher and to the esteem in which he was held by his contemporaries. Ignazio Raimondi was his most famous pupil.